Looking for the Best road bikes under budget in 2019? Our team of experts have selected the affordable and specialized road bikes for beginners out of hundreds of models. Don't buy an road bike before reading our unbiased best road bike review. Boardman Team Carbon – The Name Says It All! Who should buy a commuter bike? Who should buy a touring bike? Who should buy a time trial bike? Assembling Your Bike – DIY Or Professional Help? Road riding is an exotic sport that also gives your body amazing workout. But it’s no fun if you are riding the wrong bicycle. It’s important to know what features you can expect in your budget. Do you have only a limited budget to spend but you are expecting to find a bike with a carbon-fiber fork? Setting expectation too high would lead you nowhere. You’ll probably end up buying a road bike that you’d hate. Read the guidelines below to set your expectations. Check out the article to know how to ride a bike effectively. If your budget is limited, you can still find a cheap road bike that you’ll enjoy riding. Here is what to expect with this budget. Medium-weight bike, something around 10kg. Don’t expect to find a lightweight frame in this price range but you can easily find an aluminum frame. They don’t weight much. Mostly Shimano shifters but you will rarely find a manufacturer offering Microshift parts at this price range. Dual caliper brakes. Don’t expect anything fancy such as disc brakes in this price range. However, you can upgrade some cheap road bikes to fit in disc brakes. Low-end steel fork but you could be lucky to find a carbon fork as well. When you’ve a little more money to spend on a road bike, you can expect the following basic features. 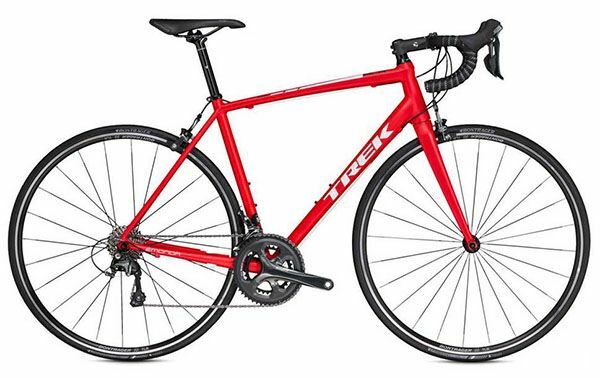 Bikes at this price range usually come with Tiagra and Shimano 105 brand components. Tektro calipers or Shimano brakes. You can get a carbon fork at this price. With a bigger budget you can expect to find a lot of features and high-quality build. Here are a few things to consider. The lightweight frame usually weighs less than 9kg. But you can also expect to find a low-end carbon-fiber frame. Custom-made for a particular rider niche. High-quality aluminum frame with many additional features. Smoother overall riding experience due to strengthened bottom bracket and other frame enhancements over other cheap road bikes. High-quality braking and shifting parts. Now that you have looked at different categories of cheap road bikes and know what you can expect considering your budget, it’s time to explore the best models. Below I will walk you through reviews of different bikes, each perfect for a different set of requirements. Buying cheap road bikes isn’t easy these days with an increasing number of choices every day. To test this hypothesis, simply look at your favorite bike blogs for reviews of top bikes in 2019. You’d be surprised to notice that almost all of them have listed unique models. That means every blogger has its own rating, making it impossible for you to figure out what’s actually the best bike in inexpensive bike category. To be honest, all those bloggers seem right. They are thinking about best bikes according to their own needs and set of problems. So, when reading the reviews of cheap bikes below, be sure to look closely at the list you made earlier in this guide. I’m sure you remember the list of your requirements at the beginning of this article. It’s time to take that note out now. When it comes to performance, comfortable and durability at this price, no one can beat the hit Vilano Forza 3.0 bike. Vilano Forza is easily the best among the cheap road bikes. It offers numerous advantages over its counterparts, such as professional-quality shifters and brakes with double-wall wheels. Here is what makes this bike the deal of the year in the category of cheap road bikes. When you buy Vilano Forza 3.0, you can be sure of one thing – great shifting system. It’s the best you can get in this price range. If you are buying a cheap road bike, there is every chance that the manufacturer would compromise the quality of shifters. But that’s not the case with Vilano. It’s a bike for those who wants to enjoy smooth shifting and high range at both low and high speeds. Another great thing about the shifters is that they are made of high-quality material. Even after years of use, they will require only minimal maintenance. If you are buying a road bike for urban riding, Vilano Forza is going to be your best friend. It’s got double-wall wheels so you can easily put tires that would last 2,000 miles plus. Another advantage of double-wall wheels, something that most other manufacturers in cheap road bikes category miss out on, is that riders can put the load on the bike. These double-walls are able to easily lift 200+ pounds. Vilano has done another important tweak with their Forza 3.0 bike that makes it superior to its competitors in this price range. That’s adjustable bike geometry. What’s the advantage, you ask? Whether you are small, tall, or medium, you will find a bike size in this model that’s a perfect fit for you. Size isn’t an issue with Vilano. Unfortunately, that’s not the case with many other manufacturers. Vilano Forza 3.0 is for anyone who is looking to buy their first road bike. It’s a budget bike but offers many great features that allow durability, performance, and swift riding experience. A bike with high-quality shifters. A bike for those who enjoy long rides. Road bikes that offer smooth ride without killing the advantages of REAL road bikes. Giordano Libero is another high-performance road bike that won’t eat up your savings. In fact, Libero 1.6 is the cheapest bike these days that comes with an STI shifters system. Here is why we think Giordano Libero is one of the best bikes at this price. Although the Giordano Libero comes with only 16 levels of gearing, it still allows a great range of high and low speed. The manufacturer has made some changes in the standard road bike gearing system to achieve this incredible range even with 16-speeds. Due to this amazing speed system, you can take this bike up a hill or race it on pavement without worrying about the apparent limitation in the gearing system. Although you are spending only a portion of what a good road bike costs, Giordano still manages to offer the lightest frame that you could possibly get at this price. When you are low on budget, one of the first things you should be ready to sacrifice is frame weight. Other manufacturers will usually put in a heavy steel frame with low-quality speed system. That’s not the case with Giordano. This bike weighs nearly 30 pounds with an aluminum frame. It seems like everything you hear about Giordano is praiseworthy. That’s not true. The manufacturers have probably made one mistake with this bike and that’s limiting the bike size to only 3. That means you will have to find a size that fits you, even if it doesn’t REALLY fit you. How could you expect to fit the entire world with only 3 sizes? It’s better that you look closely at the sizing chart before you buy this bike. The manufacturer suggests a 20-inch bike for people up to 5’8’’ taller. For people between 5’8’’ and 6’00’’, the recommended bike size is 24 inches. For anyone taller than that, the manufacturer offers a 24-inch tall bike. You want a cheap road bike that delivers good performance over the years, without crying out for costly maintenance every now and then. You want a lightweight road bike but you can’t spend a lot of money. You are buying your first bike but not sure where to begin. Giordano is a perfect first bike for commuters who still don’t have any experience with buying a bike. Kestrel Talon Road is yet another amazing budget bike that could easily be your first bike. Many bike blogs rate it as their favorite road bike in this budget category while many long-time bikers advise people to buy Kestrel Talon Road. The reason this bike gets so much love from the cycling community is simple. It’s made for road racers as well as long-distance riders. And it doesn’t cost a fortune either. Now that’s pretty much everything most people are after when they plan to buy their first road bike. Here are some more reasons, and they are pretty cool too, that make this a top road bike for entry-level racers. Whenever you are shopping for a road bike, the first thing you notice is the shifting system. Is it smooth? Does it offer range? How about maintenance? Kestrel Talon Road answers all these questions proudly. It’s smooth, offers range, and when it requires maintenance, it’s only minimal. Now that’s something you don’t expect to find cheap road bicycles. It’s actually true that Kestrel Talon Road has a carbon-fiber front fork. The main frame is made from lightweight 7005 aluminum. The fork is actually the part of a bike that delivers the shock and road vibrations while holding the weight that come down through the handlebar. Since this bike has a carbon fiber fork, you can expect minimal vibrations and therefore a smoother ride compared to what you get from an aluminum fork. If you want speed, then you need to look at tires and crankset after examining the shifters. This bike is totally superior to Vilano and others in this range as far as tires and crankset are concerned. The tires are high-quality racing tires. You REALLY feel like riding a racer bike when riding a Kestrel Talon Road. The crankset, as well as the other smaller parts, are made of high-quality material. It contributes to the overall riding experience. When you buy a Kestrel Talon Road, you know you are in for a treat. You even feel it when you rest your hands on the wider handlebar. There are minimal vibrations and you feel a lot more comfortable compared to other road bikes. Do you know what’s making it so great? It’s the way Kestrel construct the handlebar in this bike. It’s oversized. With wider diameter, you not only get better control when steering but you also ride the bike in a much relaxed and comfortable posture. Kestrel Talon Road is for everyone who wants to buy a solid bike at a discount price. The quality Kestrel offers through its parts and high-grade frames is often missing from other manufacturers in this price range. Do you want a commuter road bike? Are you expecting high-quality parts in a low-budget bike? Do you expect high-quality braking system when you buy a road bike? Are you a speedster who needs wider handlebars? NOTE: You can easily buy either Vilano or Giordano or Kestrel as they are perfect bikes for commuters. But I don’t want to limit your choices to my favorites. Here are some cheaper road bikes that my other friend cyclists refer to their friends. You can look at their reviews and see if you would be interested in one of these instead of my favorite two bikes above. If you are looking for a bike with a neat aluminum frame, then look no further. Trek EMonda ALR 4 is a lightweight bike that focuses on improving the frame. In 2015, the manufacturer decided to upgrade the frame. The new frame is made of high-quality hydroformed Alpha aluminum that offers durability. Trek, who has already pioneered invisible welding tech, is making full use of it on this bike. As a result, you get a bike that’s strong, neat, and has less weight compared to other bikes with a similar frame structure. The reason is the welding that doesn’t weigh as much as the traditional frame welding. If you are looking for a bike with the lightest possible alloy frame, then look no further than Trek Emonda ALR 4. Its frame weighs only 1,000g. The bike offers various other advantages over its competitors. For example, it comes with a carbon-fiber fork and Shimano components. When buying a bike, it’s about quality as well as choice. Canyon Endurance AL 6.0 offers both. The bike comes with an aluminum and a carbon fiber frame. You make a choice and pay for whatever you want. It’s as simple as that. If you opt for carbon fiber, you will love the riding experience. But even if you can only afford aluminum, still you won’t be disappointed with Canyon Endurance AL 6.0. Another reason to buy Canyon is the disc endurance chassis. This is probably the best chassis you can expect in this price range. Due to a slightly wider frame construction, the rider feels more comfortable when riding this bike compared to many of its counterparts. Most of you are expecting to find a carbon fiber frame, even though you can only afford a cheap road bike. The good news is that Boardman has heard to all those people. The Boardman Team Carbon bike is one of the cheapest road bikes with a carbon frame. Not only the frame, but the fork is also made of carbon fiber. This Boardman bike belongs to the manufacturer’s performance range. That means you can expect a smooth and bump-free ride on this carbo-fiber bike. However, you shouldn’t expect much from it. You can’t compare the ride experience with the high-end carbon bikes. Pinnacle Dolomite 5 is a perfect entry-level road bike for you if you are living in the UK. The bike, designed by Evans Cycles, is specifically designed for UK road conditions. The good news is that this year the company announced that it’s fitting the Pinnacle Dolomite 5 bikes with disc brakes. Isn’t that great? This bike has mudguards mounts that will help you stay clear of mud when riding on wet pathways. It’s versatile bike in this price range. Cannondale is a high-performance aluminum bike. The company is already well-known for making high-performance bikes, so you can expect it to be a good commuter bike. The bike puts the rider in somewhat upright position. Although some riders might not like the riding position on this bike, others are sure to fall in love with this upright geometry. If you are looking to buy your first bike but you don’t want to compromise on frame quality, then look no further. Buy a Cannondale CAAD8 105 and enjoy riding. Specialized Allez Elite Smartweld is a lightweight alloy bike. The company claims that they have put the most advanced alloy frame on this bike. So, why not try it? It’s definitely worth riding. The frame is lightweight and offers almost zero vibration. The Smartweld technology used to weld different parts of the frame together focuses on making the frame lightweight and durable. This technology finds sweet spots for welding so that minimal welds are required and those required actually contribute to reducing vibration. This bike comes with a carbon-fiber fork. The components are made by Specialized. You will find AXIS brakes and wheels, which deliver good solid performance for an entry-level road bike. If you are looking for a comfortable road bike, then Giant Defy 1 Disc is your thing. This bike focuses on comfort over weight. The bike is equipped with a disc braking system to give you more control and smoother braking. The frame is made of alloy, allowing for a smoother ride. However, the aluminum is mid-grade, which means you will have to sacrifice on the weight of the bike. BTwin Mach 720 is an amazingly lightweight carbon-fiber bike. The frame weighs only 1,150g, which puts it amongst the lightest frames in the market, not just among the cheap road bikes. The lower part of the frame on BTwin Mach 720 has Shimano 105 Big tube profiles that allow for higher stiffness. Coupled with a unique seat style, this bike delivers a less comfortable ride but it allows for racing. It’s a race machine that you’d fall in love the momentum you give it the first run on track. Do you REALLY need a road bike? This is the most important question you should ask yourself. So, put your reading glasses on, and read how to figure out the right road bike for your needs. Read this guide and expand your knowledge if you need. There is no limitation to what you’d like to know about bikes from frame construction to handle rod position and rim size. Road bikes are for smooth pavements and roads, as the name suggests. They are meant to speed on freeways but not on bumpy tracks. Whether you look at an expensive or a cheap road bike, you are going to find something similar in all of them – they lighter bicycles with smooth and shiny tires, meant for paved trails. However, in the last few decades, bike manufacturers have come up with numerous new models that take the best of road bikes and modify the rest to meet requirements of different terrains and road conditions. For example, there are road bikes with wider rims and tires – perfect for handling light bumps. These bikes can deliver wonderful riding experience even on slightly rough tracks. So, is there a road bike out there that would make you the happiest cyclist in the world? Do you ride with partners? In that case, what do they ride? If you bought a road bike in the past and were unhappy about it, what was the reason that made you unhappy? What do you know about road bikes? Do you know how different frame constructions can change your road riding experience totally? Answer these questions. Note down the answers somewhere and keep it safe for now. We will come to them later, after you have read the reviews. That’s when you will use these answers and all the information that you had gathered and use them to help answer the final questions – what is the best bike for you? How a bike is measured is important for you to know before you buy your first road bike. You shouldn’t buy a cheap road bike just because it was the best deal in the market. If it’s the wrong size, it’s not going to be any good. When measuring a bike, you will take the measurement from cranks to the top of the seat tube. Ideally, the size of the bike should allow you to reach the handlebars easily, without either trying too hard or feeling congested. Seat height is important. When the paddle reaching the bottom, your knee should bend at a maximum angle of 20 degrees. If the angle is big or small as a result of lower or higher seat position, the rider will suffer from stress, knee pain, and fatigue. Riding with a wrong seat height over a longer period of time could cause severe problems. You should be able to obtain a bike sizing chart depending on the manufacturer. It sets clear guidelines for the right bike road in accordance with rider’s height when standing. Lighter road bikes with narrower tires are ideally the best ones out there. Irrespective of the price, these are the bikes that will run the fastest. It’s important that you think about frame construction and tire size so that you know how fast your bike can go with minimum effort. Setting up a road bike with quality parts is as important as buying a quality frame from a top manufacturer at a low price. If you want to go 3-4 years without repairing, then the quality of the bike parts should be where you invest your cash. Frame construction and fork are important parts of any road bike. With a slightly wider frame, you feel more comfortable on the bike. Such bikes are ideal for touring and long-distance riding. Similarly, fork plays an important role in delivering a great overall riding experience as it connects the handlebar with the lower-end of the frame. If the fork is made of high-grade material, it can easily absorb vibrations and allow for a smoother ride. All the riders are different. And so are the road bikes. When you go to the market to find cheap road bikes, you are literally flooded with choices. Although you might focus on the shine and glitter of the frame, it’s not the most important part of buying a bike. Each of these bikes belongs to one or the other category, and each bike category is designed to perform better in a certain set of conditions. The trick is to know what bike category interests you. Commuter bikes are excellent road bikes with a flat-bar frame. These bikes offer advantages of road bikes but with a different handlebar. These bikes have an upright or flat handlebar, something that makes them unique in the category of road bikes. When you buy a road bike, you want a smooth ride. You plan to ride the bike only on pavements and flat roads. You can’t take the bike on a bumpy road on the countryside. Commuter bikes offer smooth ride because of a lightweight frame and narrow tires. One reason commuter bikes are our absolute favorite road bikes is the fact that you can modify them to match your needs. You can replace narrow tires with wider tires in some models, making them somewhat suitable for roughly paved trails. If you want to take some light luggage with you on your next riding trip, then you can mount cargo racks. It’s a feature that makes commuter bikes one of the highest selling road bikes. You can add mudguards and racks to the frame to avoid the mud from dropping all over you when riding on wet pavements. You can easily find commuter bikes with disk brakes, provided you are able to stretch your budget a little. So, you might want to buy a commuter bike instead of a traditional road bike when you are not comfortable with the dropped handlebar but you love everything else that a road bike has to offer. Commuter road bikes are an excellent choice for those who are looking to use cycling as a mean of staying fit. These bikes are great for day-in-day-out riding. They are reliable and comfortable. They are the bike of choice for 90% consumers who are in the market for a road bike. The best cheap road bikes usually fall under this category. But there are some other interesting categories that you should explore before you start viewing different bike models. If you think commuter bike aren’t for you because you aren’t riding on paved trails but you still want a road bike over a mountain bike, you can look into a new type of road bikes known as cyclocross bicycles or cross bikes. These new cycles are road bikes but modified enough to suit unpaved trails and pavements. They have a similar frame as that of a traditional road bike with dropped handlebar. However, these bikes have wider tires that allow a better grip on off-road surfaces. Cross bikes are great for anyone who wants a road bike but is worried about off-road tractions. These bikes offer excellent protection against mud. They even have a slightly different braking system so that the mud doesn’t deposit on the frame causing higher levels of resistance when riding the bike. Cyclocross bikes or simply cross bikes can carry light cargo. So, if you are looking for off-road riding and want to carry some load as well, consider buying a cross bike. Touring bikes are yet another category of road bikes that addresses a specific niche of consumers – the tourists. As the name suggests, these bikes are perfect for those who want to buy a road bike for long rides. Since these bikes are technically road bikes, rider puts in only a little effort and the bike races away, making it a perfect choice for long-distance rides. These bikes can be modified to carry light cargo. Touring bikes have a drop handlebar. Still, they are able to offer comfort on long rides due to the slight modification in the frame design from traditional road bikes. They have a slightly longer frame and have super tough tires to allow for riding for days while carrying the load without resting the tires. These bikes are ideal for those who have the following priorities. If you are looking for a commuter road bike that can keep you comfortable on long-distance rides, then a touring bike is great for you. These bikes are ideal for those who want to carry the load up steep while going long distances due to their low-range gearing system. Touring bikes are durable road bikes. So, if you are looking for riding for days on a road bike – worried about the comfort and load such as clothing and camping equipment – touring bike is an ideal choice for you. As the name suggests, time trail road bikes are meant to beat the clock. Their frame design allows taking advantage of aerodynamics to gain speed instantly. The rider gets into a crouching position, allowing for the magic of aerodynamics to work at the next level. Since the rider isn’t offering as much resistance as much he does while sitting in a relatively upright position, time trail bikes are ideal for the track. When you are riding a time trial bike, you don’t have to worry about anything but the speedometer. The brakes are nicely hidden to avoid producing air resistance, the frame has sharp angles, and you see flat tubes instead of round rods in frame construction. All these things are done to one end – go as fast as you can. These bikes have wheel rims made of special carbon fiber material. The tires are slim so that they have minimum interaction with the road, thus producing minimal road friction. If you are looking to cheat the wind and beat the clock, all at the same time, then buy a time trial bike right away. These are the best road bikes for speed. Even when you are low on the budget, you can find cheap time trial road bikes as various bike stores offer attractive deals for these professional bikes once a year. If you want to buy a bike for anything but not for speeding, then forget time trial bikes and look at other categories. These are only for speed enthusiasts. I’m sure you have made a choice by now. You know the bike you are going to buy or probably you have already ordered it online. It’s only obvious since the bikes I reviewed here offer a lot of value for the money. There is no reason to wait and expect for a miraculous deal to come your way. But buying a bike isn’t the only thing you should be concerned about, especially if this is your first bike. You also need to assemble it, especially the brakes and shift cables. Even if your bike comes pre-assembled, you might need to fix its brakes and make some subtle adjustments to the shifting cables. But how do you do that? I don’t recommend it DIY, especially if you are a first-time bike owner. It’s better to go to a professional and have everything assembled properly, even when it’s only the brakes. It can be really frustrating to figure it out on your own. For brakes and shifting, it might cost you only a few dollars, depending on where you live.